Shocking Statistics About Birthing in the U.S. 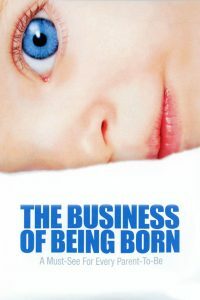 Outspoken actress and talk show host Ricki Lake turns film producer with The Business of Being Born, a documentary that examines birthing practices in the United States. This film is full of surprises, including shocking statistics about the unacceptably high rate of infant mortality in America, the prevalence and high cost of Cesarean deliveries and the contextual presentation of Lake’s own home video of the home delivery of her second child. Actually, The Business of Being Born was born out of Lake’s desire to share and compare her two childbearing experiences–the first in a hospital setting, the second at home and in her bathtub–for people who might not understand the differences between medically induced and natural childbirth. Lake brought the project to director Abby Epstein and the two women became partners in making the film. Unexpectedly, Epstein became pregnant after a year of working on the three-year project, and the delivery of her child, like Lake’s, is an integral part of the finished film. In series of brief interviews that Lake and Epstein conducted randomly on the streets of New York City and in an East Side Birthing Center, a number of soon-to-be moms indicate that they’ve never even considered home birthing and, in some cases, have very negative impressions of midwifery. One woman comments that she’s planned from before she’d even confirmed her conception that she would deliver her baby by Cesarean section in order to avoid the pain and hardship of labor. Lake, who declares that both her childbearing experiences were wonderful, clearly believes natural birthing is the preferable and more satisfying delivery method. As previously mentioned, she includes the home video of her son’s birth in the film. The film follows several women who’ve elected to deliver their babies at home with a midwife’s aide through their pregnancies and delivery. They, and Lake, avow that they find the agony of labor a form of ecstasy that brings them closer to feeling and understanding the spiritual nature of childbirth. In counterpoint, several OB/GYNs and other medical doctors cite the benefits of birthing in safer, more controlled hospital environments which can provide life-saving measures when deliveries unexpectedly become distressed. Some doctors (including Abby Epstein’s) endorse the idea of home birthing and agree to serve as backup if necessary. Other interviewed MDs admit on camera that they believe most OB/GYNs are not sufficiently familiar with midwifery as an alternative and claim they tend to push drugs that cause contractions and recommend C-sections when they’re not entirely necessary. At any rate, The Business of Being Born reveals that the United States, where the majority of childbirths occur in hospital settings, has the second highest rate of infant mortality (sharing that rank with Poland, Slovakia, Malta and Hungary) among 33 industrialized nations in the developed world. European nations where midwifery and at home birthing prevail have much lower infant–and delivering moms–mortality rates. Equally shocking: Cesarean section is the most frequently performed surgery in the US, at a cost of $14-billion annually, and 82 percent of physicians said (in a 1999 survey) they performed C-sections to avoid negligence claims. These statistics certainly indicate a huge and unnecessary burden that’s being placed on our health care system’s resources. The Business of Being Born presents an interesting, compelling debate about a subject that’s of interest and concern to us all–whether or not childbearing happens to be on our personal agenda.